The Municipality of Tweed has a by-law for the licencing & regulating of dogs. By-Law No. 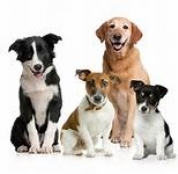 2014-07 requires that every owner of a dog register & licence their dog each year. Why do I need a dog tag? Not only does purchasing a dog tag mean you are complying with the Municipality’s by-law, a dog tag also ensures that your dog can be tracked to you if it is lost or goes missing. The Municipality keeps a record of all dog tags sold, including the owner’s name & address. The number on the tag can be traced back to the owner if a lost dog is found. How much does a dog tag cost? Tags are $15.00 per dog until March 31st. Price increases to $45.00 per dog on April 1st. Where can I buy my dog tag? Dog tags are available in the Municipal Office at 255 Metcalf Street, Tweed. Animal Control will be carrying out door-to-door dog tag sales in the spring. The late fee will apply to all dog tags sold during the door-to-door campaign - $45.00 per dog. Is there a fine for not getting a dog tag? Yes - the by-law does include a fine for not having a current dog tag affixed. The by-law permits up to three (3) dogs at any one residence. A kennel licence is required for more than three dogs, and kennel licences are not permitted in the Village or Hamlets, or on any Rural Residential zoned properties. The Animal Control Officer issues all kennel licences. The phone number for the Animal Control Officer is 613-478-3547. The Tweed Animal Shelter is located at 139 Allore Road in Stoco. Where can I get a copy of By-Law No. 2014-07? A copy of the by-law pertaining to the licencing & regulating of dogs is available from the Municipal Office or from the By-Laws page of the Municipal website.